With Working Pen- Antenna Hidden In Inkwell! The Ultimate In Covert Video Wireless Bodywear! To the human eye, it looks like an ordinary pen but this PenCam is the ultimate in undetectable covert video surveillance! It cleverly conceals a quality color video camera inside a working pen to discreetly monitor and record those covert operations. The tiny pinhole camera lens and minimum illumination makes it ideal for undercover assignments and discreet surveillance. 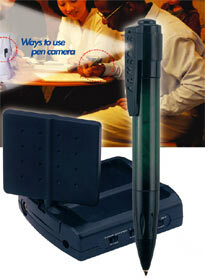 The PenCam can be worn innocently in a shirt pocket while recording all the events that occur in front of the wearer. Simply connect the receiver to your TV, VCR, DVR or security monitor and start your discreet assignment today.